Planes, boats and bicycles--sv & rv Odin: The BVI's are just SWELL! As we cruise back through the Virgin Islands this season, our goal is to visit anchorages we skipped last time. When we could find all around protection last year, we took it. This season, I'm hoping to be more adventurous. New friends are sharing their favorite spots and I'm keeping a list. However, in passing, someone mentioned, "We got caught in an anchorage with a ground swell and had to move in the middle of the night." How do we avoid that?! So, I looked it up. 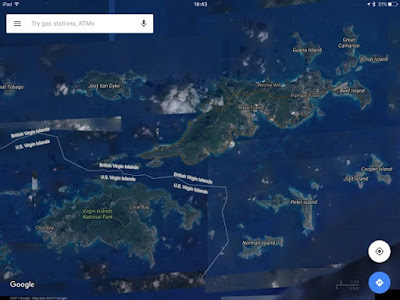 According to the Scott's "Cruising Guide to the Virgin Islands" (the bible for this area), certain anchorages should be avoided when the "ground sea is running." One example is Trunk Bay, St. John. OK, what is it and where is that forecast? In the same book in the Virgin Weather section, they refer to ground swells. The same thing? Confusing. "During the winter months of November through April, any significant weather in the North Atlantic will product heavy swells along the entire north coast of the Virgins several days later. These ground swells have little effect on vessels under sail, but can turn a normally tranquil anchorage into pounding surf. Most anchorages exposed to the north are prone to this phenomenon--chose your anchorage accordingly." Hmmmm. More information please. On our visit to the BVI's last year, friends warned us off of Cane Garden Bay and the north side of St. John during a "North swell". (Yep, the cruising guide confirms Cinnamon Bay is "untenable during northeast ground seas")! 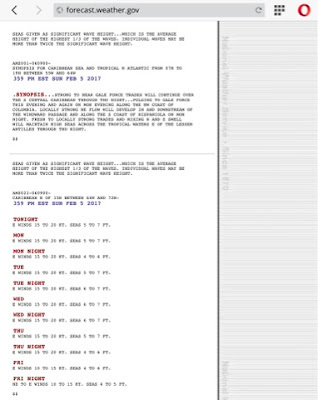 This led us to subscribe to the NOAA Wave Period/Swell Direction Forecast (or read all the way to the end of the Chris Parker forecast). 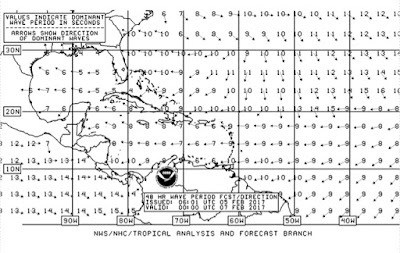 North swell is also briefly discussed in Bruce Van Sant's weather section regarding the north coast of the Dominican Republic. 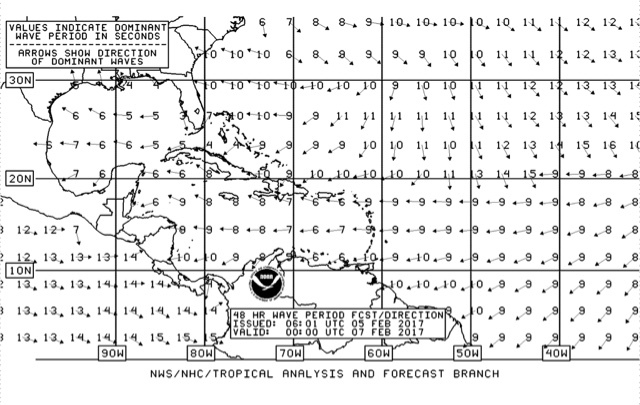 Further googling swell in the Virgin Island area revealed the terms "Atlantic swell" or references to "No swell". (Isn't there is always an ocean swell ie. Statia?! Apparently it means "No north swell"). "Windswells are swells that are generated by local winds within a few hundred miles of the coast. As a result, the swell periods are short (four to 10 seconds between crests) and the waves tend to stack up on each other with very consistent sets. 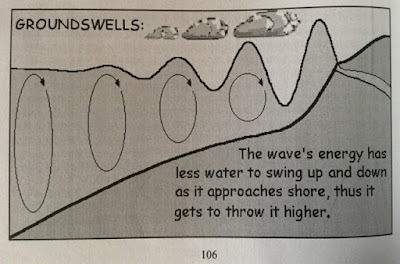 Also, a windswell's energy doesn't extend very deep -- maybe only 100 feet or so -- so it can only travel a few hundred miles before dissipating because most of the wave energy is concentrated closer to the ocean surface. Groundswells are swells that are usually generated by winds much farther away. These swells are created by strong winds over long distances -- we refer to this distance as the "fetch" -- and over longer periods of time. As a result, more energy is transferred into the water during the generation of the waves, which create longer swell periods. Waves with longer swell periods can travel great distances without losing the swell energy like windswells do. Furthermore, swell energy in groundswells can also extend down to around 1,000 feet deep. This allows greater interaction with the ocean floor when the groundswells move into shallow water. For example, this process of refraction will allow groundswells to wrap into a spot -- up to 180 degrees or more -- while windswells wrap very little if at all." And this is why the ground seas running or north swell is so dangerous for sailors. Summary: Take any groundswell/ground seas/north well SERIOUSLY. It's not just "windy and rolly". We sat out the last north swell tucked into Ensenada Honda, Culebra, Puerto Rico. My final definition: Any significant low pressure system in the North Atlantic can create an ocean swell thousands of miles ahead of it. The strong winds over long distances (fetch) creates longer period swells of 10-20 sec+ period. These waves have more energy than a normal wind driven wave, extending down to 1000 ft deep. This can make unprotected northern anchorages in the Virgins not just rolly but "untenable" (unable to be occupied--calculating the scope required is precarious and picturing what it is doing to your anchor should also keep you up all night). It will produce strong rip currents ("no swimming" warning from the BVI during the last "Northerly"), and landing dinghies can be dangerous (ie. The Baths, Virgin Gorda). The swell may last for 3-4 days. And don't forget: swell may arrive the 1-2 days before the forecast wind shift! The waves travel ahead of the weather system! 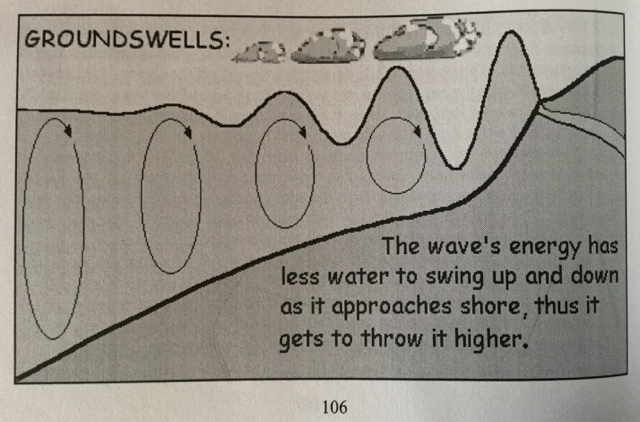 On a side note: This relates back to a discussion about waves and swell in my previous weather blog (what-do-you-use-for-weather). Here is how a north swell can affect your forecast. 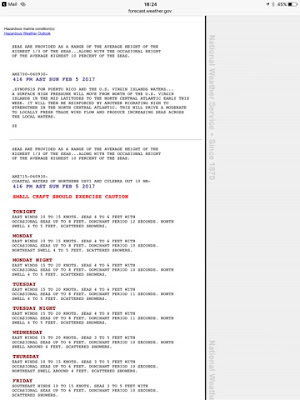 Van Sant recommends always using the NOAA Offshore Report, but this season I've discovered the NOAA Coastal Water Report puts the "wind" wave and "swell" wave forecast next to each other, so it's easier to recognize a confused sea state. If you compare the swell to the normal wave forecast, you can more easily predict "washing machine" seas. Not comfortable, and slows us down. Example: EAST WINDS 10 TO 15 KNOTS. SEAS 4 TO 6 FEET WITH OCCASIONAL SEAS UP TO 8 FEET. DOMINANT PERIOD 10 SECONDS. NORTH SWELL 4 TO 5 FEET. Planning a sailing trip in November in the BVI I find your postingvery interesting thanks!